Setting the priority value of a rule allows you to change the order of which the system executes (or processes) the rule actions/conditions. Let's say you wanted $10 off then $5 off. Your first rule would therefore be higher priority than the second rule. Higher priority rules run first, then the lower priority rules run after. Higher priority rules have a lower priority number in the rule configuration. Rule priority options are available for all types of MageRewards points rules. 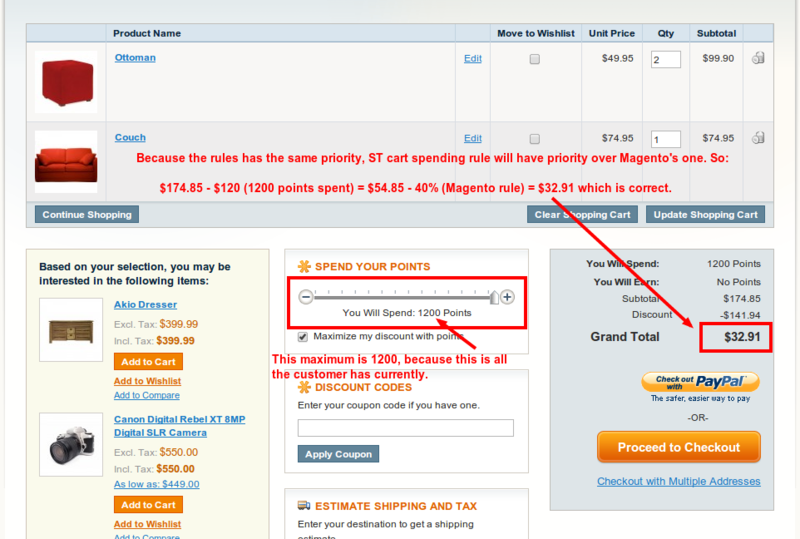 MageRewards points rule priorities are compared with standard Magento price rules. This allows store owners to choose whether a particular shopping cart price rule discount (or coupon) is calculated after or before the points redeemed. Note: If there's a MageRewards Shopping Cart Spending Rule and a Magento Shopping Cart Promotion Rule that both have the same priority, first Magento will apply discount from spending points (the ST rule) and only after that it will apply the Magento promotion rule discount. Rule #2: 10.00 fixed discount with priority 20. Result: The cart gets 10.00-off for spending 500 points for Rule #1, then an additional 10.00-off for Rule #2. Therefor if 500 points are spent, the total resulting discount is 20.00-off. Rule #2: 10.00 fixed discount with priority 10. Result: First the cart gets a 10.00 discount for Rule #2, then the cart gets 10% off the remaining total from Rule #1 if 500 points are spent. That comes up to9.00-off. Therefore if 500 points are spent, the resulting discount is 19.00-off. Do rule priorities work in combination with Magento rule priorities? Yes they do. Shopping Cart Redemption rule priorities work in combination with shopping cart discounts, and catalog redemption rule priorities work with catalog price rule priorities. Can I disable rules that are lower priority and valid? You sure can! Check the article about the Stop Further Rule Processing flag that you can set in your rule creation. It will disable any valid rules that are lower priority.